This is a great shape recognition activity for preschool kids that also involves color recognition and hand-eye coordination. The classroom activity encourages to kids explore new shapes by themselves and paint without any limitations or guidelines that improves their hand-eye coordination. The shape activity is especially designed for preschool kids so that they can explore shapes and creativity with fun. Advise kids to draw as many shapes, with crayons, as they can on white sheets of paper. This part of the preschool activity will help them discover new shapes by chance! 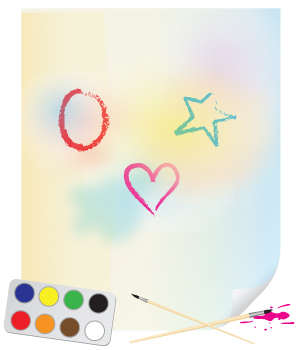 Next, ask them to dip their paintbrushes in water color and paint over the shapes that they made with crayons. This is where kids can go berserk with the colors and color as they like, developing their hand-eye coordination. The shapes will pop up from the layer of water color and the paintings will look like a beautiful masterpiece! Pin the creations on the school bulletin board.